After sifting through 8,000 entries in multiple languages — even in Esperanto! — the contest to name Philae’s landing site on Comet 67P/Churyumov–Gerasimenko has resulted in an Egyptian-themed name. The European Space Agency lander will touch down on the comet on a site dubbed “Agilkia”, which is named after an Egyptian island that hosts the Temple of Isis and other buildings that previously were on the island Philae. The buildings were moved due to the Aswan dams flooding Philae in the past century. 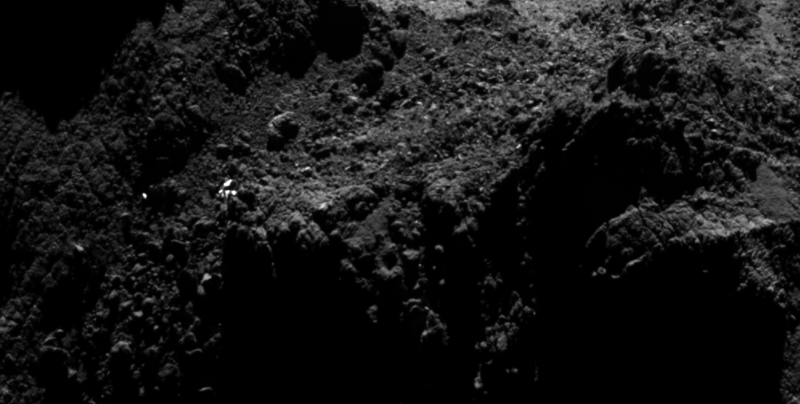 Agilkia, which was voted for by more than 150 people, fits in perfectly with ESA’s decision to informally name features on the comet after Egyptian names. Mission planners for the Rosetta orbiter and its lander, Philae, previously dubbed the site “J” before the landing contest was announced. Alexandre Brouste from France was voted the overall winner and will be invited to follow the Nov. 12 landing live at ESA’s Space Operations Control Centre in Darmstadt, Germany. The landing is expected to take place around 12 p.m. Eastern (4 p.m. UTC), and you can follow the livestream here. For more details on how Philae will sail to the surface, check out this past Universe Today story.